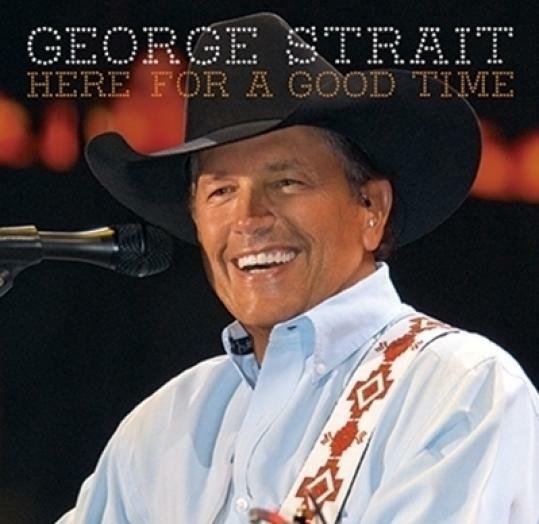 George Strait’s been comfortable in the role of song interpreter for three decades. For all that time he’s been selecting sturdy, traditional-leaning country compositions by, say, Dean Dillon or Jim Lauderdale and giving those numbers an easygoing, straight-and-true delivery. But who’s to say Strait can’t decide it’s time to turn singer/songwriter, even this late in the game? After 37 studio albums worth of songs written by other folks, he wrote a few with his pro-rodeoing/songwriter son Bubba Strait and Dillon for 2009’s Twang. On Here For A Good Time, the father-son-and-Dillon co-writes are in the majority—seven of the 11 tracks. Contributing all that songwriting is something new for the elder Strait, but the songs themselves don’t amount to a radical departure for one of country music’s steadiest figures. One of them, “I’ll Always Remember You,” even commemorates the other side of the longevity equation: the 30-year faithfulness of his audience. The new album gets its name from a sanguine, swinging original that’s as good as any good times song you’ll hear on contemporary country radio, and better than most. Strait’s sense of humor also comes through in his wonderfully wry cover of Delbert McClinton’s hard luck honky-tonker “Lone Star Blues.” On the other hand, “Blue Marlin Blues,” which arrives a few tracks later, is just plain hokey. No matter what the album title reads, the bad, or at least pensive, times on this Strait set outnumber the good. But from a song quality perspective, that turns out not to be a bad thing at all. “Drinkin’ Man” and “Shame on Me” are back-to-back originals, the former a ballad that offers an unflinching account of addiction and the latter a top-notch two-step confession of a bruised heart. Strait follows those with a slow-burning reading of “Poison,” a well-crafted reflection on self-destructiveness by Chuck Cannon and Allen Shamblin. But nothing on Here For A Good Time rings truer than Strait’s cover of Jesse Winchester’s road-weary chestnut “A Showman’s Life.” There’s no fuss to his performance. He leans into the most desperate lines and nearly lets his voice crack, all in the service of the thing he’s always been best at—making a heavyweight song hit home.